Pair of Chinese Export Porcelain Famille Rose Armorial large size silver shape Meissen style fruit baskets on stands with shaped handles and applied rosettes for the Dutch market Arms of Arnoldus Adrianus Van Tets (1738-1792) and his 2nd wife Wilhermina Jacoba Hartingh (1750-1813) who married in Batavia Jan. 2, 1767. The Van Tets name comes from German village of Tetz close to Linnich an de Ruhr. The ancestor of the Dutch branch is Wilhelmus Van Tetz (1649-1690) who was a surgeon in Amsterdam. Both his son, grand son and great-grandson were active overseas, in the East Indies as well as in West Africa. Arnoldus Adrianus Von Tetz (1738-1792) sailed to Batavia in 1755, becoming senior merchant and delegate of native afairs. He left Batavia in 1769. Back in Holand he became burgomaster in Dordrecht. This armorial service must have been ordered soon after his second marriage in 1775 to Wilhemina Jacoba Hartingh (1750-1813). Prior: Personal Collection of Elinor and Horace Gordon. Page 32 Collecting C.E. 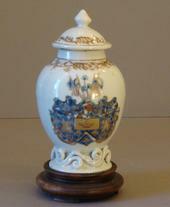 P. and page 347-8 Chinese Armorial Porcelain for the Dutch market by Dr. Jochem Kroes. Purchased by E. Gordon 1977. #2 Basket both handles restored, #3 Tray minor frits, #4 Basket faint glace line-wells, #5 Tray 1 rosette restored – blue. Pair of Chinese Export Porcelain Famille Rose sauceboats on original lobed undertrays – molded to resemble English silver gadrooning – undulating Aubergine ribbons and colourful European floral sprays – Inner Aubergine daisy link borders – Note molding under spout and molded panels on sauceboats. Chinese export porcelain overglaze blue, gilt rouge de fer and gridaille teapoy made for the Swedish market Arms of Gruners with original lid � flare base with scrollwork. Chinese Export Porcelain Famille Rose Mazarin with crest of an eagle and central scene of exotic birds – possibly made for Moses Benson of Shropshire who lived at Lutwych Hall and made a fortune in the West Indian Trade from Liverpool and Ulverston and of Kingston, Jamaica. This eagle is Bourne by 30 families but this design is of The Benson family – CAP II page 222 mug private trader #225. Chinese Export Porcelain Famille Rose Rattan molded double handled oval basket with European floral decoration applied rosette and replaced rouge de fer twisted handles with leaves. Provenance: Helena Woolworth McCann collection. 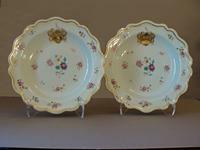 Pair of Chinese export porcelain Famille Rose dinner plates. Yung Cheng or Chien Lung. Central flowering tree alternating pink and green inner borders outer floral vines excellent coloration. 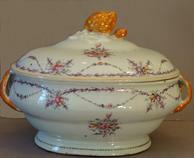 Chinese export porcelain Famille Rose Bombe oval soup tureen with peach pit finial. Mauve bamboo stars garlands and European floral sprays. Two frits otherwise perfect condition. 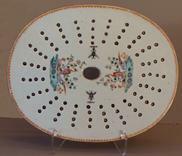 Pair of Chinese export porcelain Famille Rose Armorial soup plates. Arms of Grill, for the Swedish market involved in the Swedish East India Co.
Rare pair of Chinese export porcelain Famille Rose teapots with finely painted rose and peony garden. Dramatic spout and handled in dragon form. Flower formed finials original lids and excellent coloration. 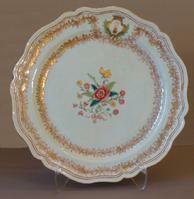 Chinese Export Porcelain Famille Rose molded rim silver armorial charger. French crest of Audibert of Marseille. Ordered for Georges. Antoine (1747-1821) important in commerce and owner of one of the most magnificent townhouses in the city. Finely painted central decoration of ribbon. Tied European floral bouquets, featuring roses and yellow Dutch tulips, unusual double gilt and rouge de fer leaf and vine outer border - Audibert family came from Le Claire (near Provence) Listed Lebel p 257. 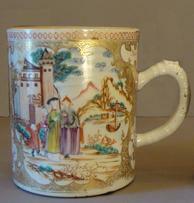 Chinese Export Porcelain Famille Rose Mandarin Tankard with elegant house and figures by a river. original gilt scroll work. Grisaille and rose floral and bird vignettes finely molded stock handles. 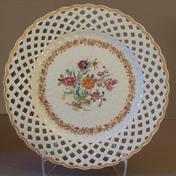 Chinese Export Porcelain Meissen style Famille Rose reticulated plate with basketweave molding. Cavetto border of rose and gilt floral vine. Lush European floral bouquet.